Gov. 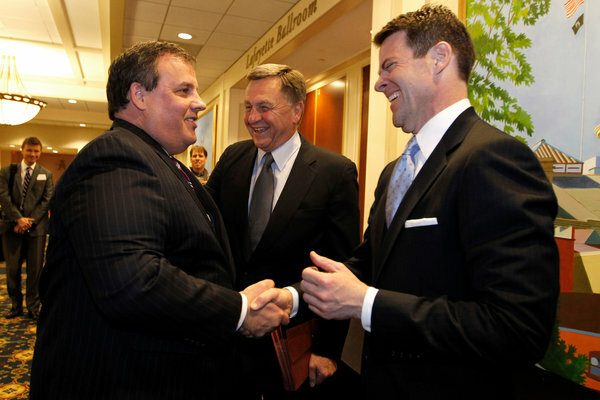 Chris Christie with Bill Baroni, right, and David Samson, the chairman of the Port Authority of New York and New Jersey, at a 2011 conference in Trenton on New Jersey transportation. For a state that lost hundreds of lives on Sept. 11, the gifts were emotionally resonant: pieces of steel from the ruins of the World Trade Center. They were presented by the Port Authority of New York and New Jersey to 20 carefully chosen New Jersey mayors who sat atop a list of 100 whose endorsements Gov. Chris Christie hoped to win. At photo opportunities around the mangled pieces of steel, Bill Baroni, Mr. Christie’s top staff appointee at the Port Authority, told audiences how many people wanted a similar remnant of the destroyed buildings, and how special these mayors were. Mayors lower on the list of 100 — such as Mark Sokolich, of Fort Lee, at No. 45 — received other Port Authority perquisites: an intimate tour of the National September 11 Memorial, or the new World Trade Center construction site, or Port Authority money for jobs programs or new firefighting equipment, even in towns far from the port. Mr. Christie and his allies at the Port Authority are now entangled in a scandal over the closing of lanes leading to the George Washington Bridge — apparently a politically motivated move aimed at Mr. Sokolich, who had declined to endorse the governor. But long before the lane closings, the Port Authority — a bistate government agency financed by tolls and taxes — had already been turned into a de facto political operation for Governor Christie, a review of the agency’s operations since Mr. Christie took office suggests. Turning wreckage of the twin towers into politically motivated gifts before Mr. Christie’s 2013 re-election was only one example. The authority became a means to reward friends (or hire them) and punish adversaries, and a bank to be used when Mr. Christie sought to avoid raising taxes. Major policy initiatives, such as instituting a large toll and fare increase in 2011, were treated like political campaigns to burnish the governor’s image. These maneuvers emboldened the Christie team, former Port Authority colleagues say, to close down the lanes on the world’s busiest bridge — ensnaring them in state and federal investigations. Mr. Christie’s allies at the agency were public, even proud, about their mandate to reshape the agency. The Port Authority was formed in the 1920s to run the various ports, tunnels and bridges shared by New York and New Jersey, with each state choosing its own administrators and directors, who were supposed to work together. “Its rebuilding is a passion to the Port Authority, and it’s a passion to our governor and lieutenant governor,” he added. Remarks like that rankled New York colleagues at the Port Authority, who felt a tug of war with New Jersey over money to rebuild the site after Mr. Christie’s allies conveyed a clear rule: If New York got something, New Jersey had to get something, too. In exchange for the World Trade Center, for example, New Jersey secured projects including the $1 billion raising of the Bayonne Bridge and the rebuilding of the Pulaski Skyway — an unusual undertaking for the Port Authority, because it does not connect the two states. Mr. Baroni’s lawyer did not return calls seeking comment, and Mr. Wildstein’s lawyer declined to comment. Mr. Wildstein, a onetime anonymous political blogger who, like Mr. Baroni, has resigned in the wake of the lane closings, was hired in 2010 and quickly developed a reputation as the governor’s enforcer at the agency. He was known to schedule meetings with subordinates early on Monday mornings — never specifying the topic, leaving them to fret for the weekend — then cancel. He seemed to appear from nowhere in officials’ doorways, staring until they invited him in. Mr. Wildstein helped end the practice of letting former Port Authority commissioners have free tolls for life, after Mr. Christie had railed against it. The Port Authority had long been accused of patronage, something longtime agency employees said that the Christie administration had continued. The administration recommended dozens of people with close ties to the governor or his inner circle — often without relevant experience — for jobs at the agency. These hires included a gourmet food broker and longtime Republican donor, who was given a job as a financial analyst, and the co-author of Mr. Baroni’s self-help book, “Fat Kid Got Fit: And So Can You!” — who received a part-time job as publications editor that paid more than $50,000 per year. Mr. Christie also used the agency to help him out of political jams. When he came into office, his state’s Transportation Trust Fund, traditionally financed by the gas tax, was nearly empty. But Mr. Christie, as a candidate, had pledged not to raise taxes. The Port Authority’s involvement in a major project, it turned out, presented a perfect solution. In 2010, Mr. Christie canceled construction on a planned railroad tunnel under the Hudson River that would have eased congestion for Amtrak and New Jersey Transit trains, and used $1.8 billion that the Port Authority had planned to spend on it to fill the trust fund. As a Republican administration in a blue state, the governor’s team began considering strategies for his re-election early in his first term. The agency’s spending served Mr. Christie well as he campaigned, all with an eye to building a broad coalition that would allow him to seek the Republican nomination for president. The governor’s push for projects like raising the roadbed of the Bayonne Bridge helped win endorsements from unions that had backed his opponent in 2009. The agency spent millions of dollars on projects in towns Mr. Christie wanted to win. For example, $25 million went to a new PATH station in Harrison, where Mayor Raymond J. McDonough became the first Democratic official to endorse Mr. Christie. Mr. Baroni, often accompanied by Lt. Gov. Kim Guadagno, one of Mr. Christie’s top aides, delivered the World Trade Center steel to communities like Secaucus and Tenafly where the campaign sought endorsements. Mr. Baroni also frequently gave tours of the construction site, with guest lists that included Democrats whose support the governor was seeking. A tour last year on Aug. 23 included Mr. McDonough, and Dawn Zimmer, the Democratic mayor of Hoboken; the governor’s campaign wanted her to support Mr. Christie — or at least, not endorse his Democratic opponent. Mr. LaBarbiera added that when he informed the campaign that he would not endorse the governor, his relationship with the administration did not change. Perhaps the boldest use of the Port Authority as a political tool, a complex sleight-of-hand that raised questions at the time but succeeded anyway, involved large toll increases at the Hudson River crossings in 2011, at the end of Mr. Christie’s first year in office. The episode has recently drawn scrutiny in several major New Jersey newspapers. At the time, the agency wanted to raise money on the bond markets. But it was becoming apparent that it would not be able to raise enough without a toll increase. No governor wants to raise tolls, even by an agency shared with a neighboring state. But the issue was particularly nettlesome for Mr. Christie because he had branded himself a fiscal conservative. An account fleshed out by several participants describes what was essentially a political campaign to convince voters that Mr. Christie had lowered the tolls rather than maneuvered to raise them. While officials in New York signed off on the maneuver, the participants said, the Christie administration was the driving force. Mr. Baroni took charge. He set up a confidential war room on the 15th floor of the building on Park Avenue South and put restrictions on who could enter. Inside, agency employees ran numbers for various proposed increases, and set up computers to monitor news coverage of the plan. The initial projection for car tolls had been an increase of $4, spread over two years. But on Aug. 3, Mr. Wildstein, Mr. Baroni and Mr. Samson went to Trenton and met with the governor and five senior staff members, including his chief of staff, his chief counsel, and Deborah Gramiccioni, the head of the authorities unit (who was named to Mr. Baroni’s post at the Port Authority when he resigned as the bridge scandal burgeoned in December). Mr. Christie instructed the group to propose a plan for a $6 increase for cars by 2014. He told them that he would publicly rail against it, and that the agency would then agree to a lower number, easing the inevitable political fallout while still getting new income, according to a person who was briefed by an attendee on the participants and what was said. The possibility of a similar ploy — announce an outrageously high increase, and then knock it down — had been considered before toll increases were proposed in November 2007, in a meeting between Port Authority officials and the administration of Gov. Jon S. Corzine, according to two people involved in the discussions, but it was dismissed as too contrived. The day before the Port Authority board was to vote on the increase, Mr. Christie and Mr. Cuomo released a letter declaring that they had found a way to lower the toll increases — for cars, the cost would go up $4.50 by 2015, rather than $6 by 2014. “We are pleased that our work together resulted in lowering of the original toll increase,” they said. The board approved the increase unanimously. Among Mr. Christie’s allies at the agency, the campaign was considered a success. Mr. Baroni hung a photograph of participants on his office wall. It was not quite over. The travel organization AAA sued, but was blocked when it tried to gain access to communications between the agency and the governor’s office. In April 2012, Mr. Baroni went to Washington to answer questions from a committee hearing called by the late Senator Frank R. Lautenberg of New Jersey, a Democrat and frequent critic of the governor. The hearing devolved into a shouting match. Aides to Mr. Christie cheered Mr. Baroni’s performance. In private, though, Mr. Baroni expressed ambivalence about the confrontation with Mr. Lautenberg. He sent word through mutual friends to people on Mr. Lautenberg’s staff that he regretted the scene. The instructions, he explained, had come from Trenton.